Some family members should be avoided at all cost. But that is not the focus of this entry so I will get to that in a moment. 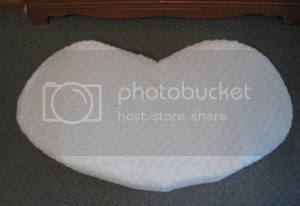 For my first craft project I decided to post my heart floor cushion. This project started out with a water main break in my house. Which led to a collapsed waterlogged ceiling destroying a majority of the furniture in my room including my computer desk. I went on a search for a new desk but could not find any I liked. 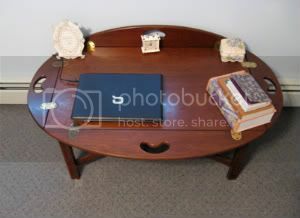 Being thrifty I thought the old butler's table from the foyer would make a cute desk. It works well and does not overpower my room. The only problem was I had to sit on the floor. 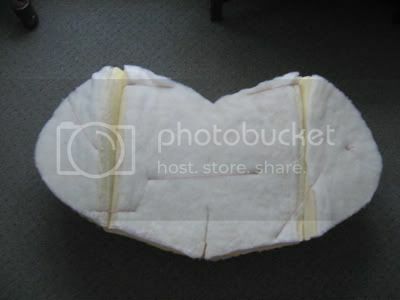 This new problem sent me on another quest: a floor cushion. I knew what I wanted, a blue heart, but I couldn't find a store that made that shape or color combination. This is where my family member comes into the picture. My aunt having discovered her new ecological conservationist roots bought me three cushions from her couch she was going to get rid of. - "Recycling these will help the environment! ", she told me. Now left with these three disgraces to the environment and my own devices, I began my work. 1. 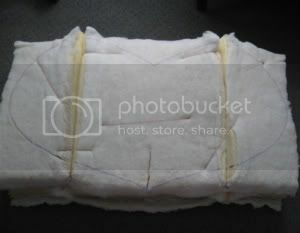 I cut half of the cushions down the middle and toward the ends making sure not the cut through the folds I had created. 2. I basted the cushions together to keep them in place. Then I drew the outline of the heart I wanted. 6. 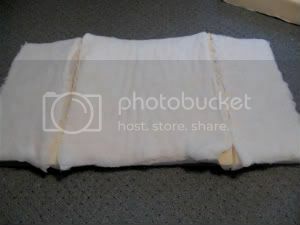 Then I sewed the fabric together, put it on the cushion form, and sewed the pillow closed. Ta-da! 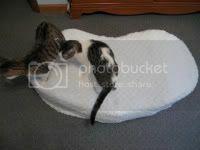 Now I have a wonderful "environment-saving" floor cushion which is very comfortable. The only problem now is my cats like to steal it while I'm not looking. The fabric is indeed beautiful and very soft. 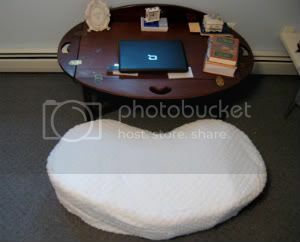 If the cushion were not gigantic I would probably carry it around the house with me all day. Craft projects are wonderful. I especially loved your Krrunch project. 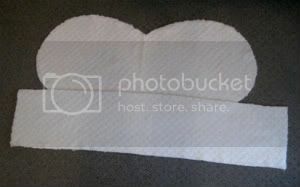 I would have never thought of folding the Pringles cover to make roses. P.S. it is spelled "sewing" not "sowing" unless you are planting seeds! that cushion is so cute! This is an adorable craft project! And it looks so comfy too. That is such a clever idea! I love that you re-used something. More people should be doing things like this. P.S You have the most adorable cats! Sparklewolfie: Thank you for the correction. I was typing too quickly to catch that mistake. Lynne: I love how cats feel especially assume they are entitled toward textbooks. Lolitadewdrop : Thank you! It was an excellent idea. Though I wish they were not part of a cause for my aunt to buy another couch (which she is currently unhappy with). Thank you. My kitties are cute, but can be bad. Interesting post you got here. I'd like to read a bit more concerning this theme. Thanx for posting that data. I was introduced to your blog by my daughter, yipyipfoxy. Looking forward to visiting often. Great project! 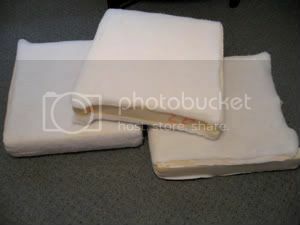 I like the "think outside the box" approach you took by cutting the cushions to open them up.